Come Experience "The Great U.P." U.P. Cruising and Michigan’s Upper Peninsula businesses have teamed up to welcome motorcycle riders, clubs and organizations to the land between the lakes. For ten bucks a U.P Cruising Biker Discount Card will save you that and more on your next ride to Michigan’s Upper Peninsula. The U.P. Cruising Biker Card is accepted by over 100 businesses all across the Upper Peninsula of Michigan. Showing the card to participating businesses gets you discounts on food, lodging and tour tickets. The card has the look and durable feel of a credit card, but it’s not A credit card. There are no renewal or monthly fees associated with the purchase this card. The card is accepted now by many businesses year round. (Call ahead to confirm) So whether you cruise in on your bike, ATV or snowmobile, don’t forget to bring your card. Cards typically ship within 1-2 days after receiving your order. (CURRENTLY UNAVAILABLE – Updates coming soon, check back) If you belong to a club and are interested in purchasing five or more cards, please contact us for quantity discount pricing. Listed below alphabetically by city are businesses who have gone the extra mile by offering special biker discounts. Just show them your U.P. 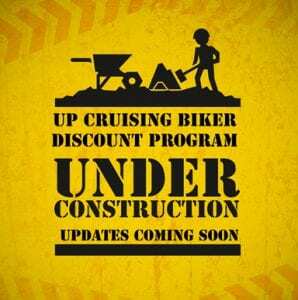 Cruising Biker Discount Card to receive your discount. Find locations supporting the discount in the list below, or print a PDF version.